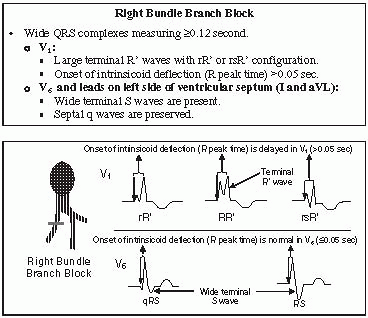 · Right bundle branch block: Conduction of the sinus impulse can be interrupted at the level of the right bundle branch resulting in right bundle branch block (RBBB) (Fig. 10.1). · ECG findings: Unlike fascicular blocks in which the electrocardiogram (ECG) findings are best seen in the frontal leads, the ECG changes of RBBB are best recognized in the precordial leads V1 and V6. The hallmark of RBBB is the presence of wide QRS complexes measuring ≥0.12 seconds with large terminal R′ waves in V1 and wide terminal S waves in V6 as well as in leads I and aVL. The septal Q waves are preserved. · Bundle branch block is a more extensive conduction abnormality than the fascicular blocks. In RBBB, the QRS complex is widened by ≥0.12 seconds because activation of the entire right ventricle is delayed. · The axis of the QRS complex is not significantly changed and remains normal when there is RBBB (Fig. 10.2, Fig. 10.3). The axis may shift to the left if left anterior fascicular block (LAFB) is present or to the right if left posterior fascicular block (LPFB), pulmonary hypertension, or right ventricular hypertrophy is present. · In the setting of RBBB, only the first 0.06 to 0.08 seconds of the QRS complex should be used in calculating the axis of the QRS complex because the terminal portion of the QRS complex represents delayed activation of the right ventride (Fig. 10.3). Figure 10.1: Right Bundle Branch Block. In right bundle branch block, the QRS complexes are wide measuring ≥0.12 seconds. Large terminal R′ waves are present in V1 with rR′ or rsR′ configuration. V6 shows wide S wave with a qRS or RS configuration. The onset of the intrinsicoid deflection also called R peak time is prolonged in V1 but normal in V6. Figure 10.2: Complete Right Bundle Branch Block. The QRS complexes are wide measuring ≥0.12 seconds. rsR′ configuration is present in V1 and qRs configuration is present in V6. Wide S waves are present in leads I and V6. The axis of the QRS complex in the frontal plane is normal. · Right bundle branch block + left anterior fascicular block: RBBB can occur in combination with a fascicular block. Thus, RBBB + LAFB are present if the sinus impulse is simultaneously interrupted at the right bundle branch and left anterior fascicular branch. RBBB in combination with LAFB is an example of a bifascicular block because two conduction pathways are interrupted. Activation of the ventricles can occur only through the remaining left posterior fascicle. · ECG findings: The typical features of RBBB are seen in the precordial leads and that of LAFB in the frontal leads (Fig. 10.4). 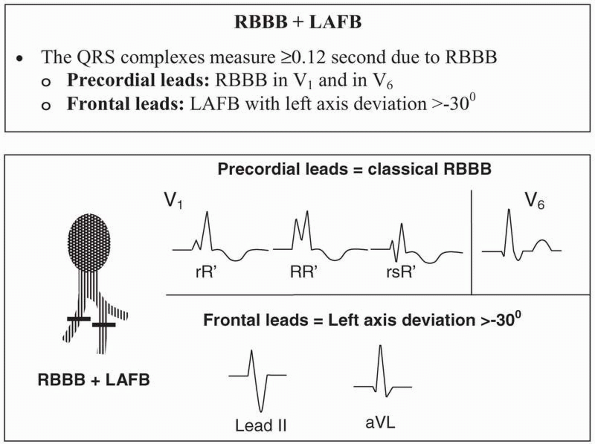 o RBBB: The QRS complexes are wide measuring ≥0.12 seconds because of the presence of RBBB. The characteristic rR′ or rsR′ pattern is present in V1, and wide S waves are present in V6. o LAFB: In the frontal plane, the axis of the QRS complex is >-30° with rS in lead II and tall R wave in aVL. · RBBB + LPFB: RBBB + LPFB can occur when conduction across the right bundle and left posterior fascicle is simultaneously interrupted. RBBB + LPFB is also an example of bifascicular block (Fig. 10.5, Fig. 10.6, Fig. 10.7, Fig. 10.8). · ECG findings: The presence of RBBB and LPFB is recognized separately. 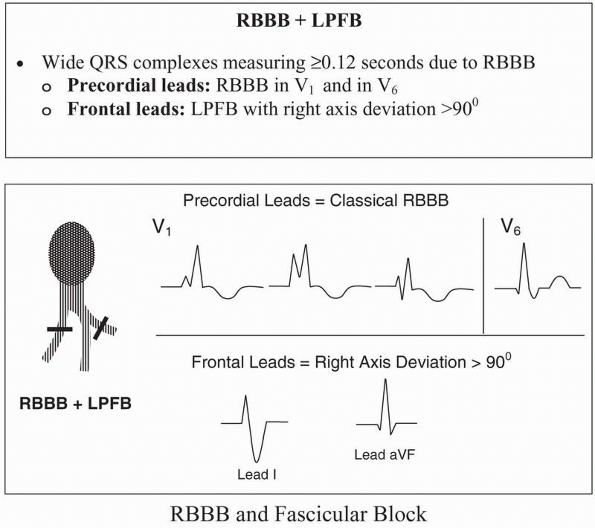 o RBBB: The typical features of RBBB are best recognized in the precordial leads as widening of the QRS complex (≥0.12 seconds) with a characteristic large terminal R′ (rR′ or rsR′) in V1 and wide S in V6. o LPFB: LPFB is best recognized in the frontal plane as a shift in the QRS axis ≥90°. Deep S waves are present in lead I, with tall R waves in leads III and aVF. For LPFB to be considered, other causes of right axis deviation should first be excluded. Figure 10.3: Right Bundle Branch Block Alternating with Normal Conduction. Note that when right bundle branch block occurs (arrows), the axis of the QRS complex using only the first 0.06 to 0.08 seconds is not significantly changed when compared with the normally conducted QRS complexes. Figure 10.4: Diagrammatic Representation of Right Bundle Branch Block + Left Anterior Fascicular Block. The QRS complexes are wide. 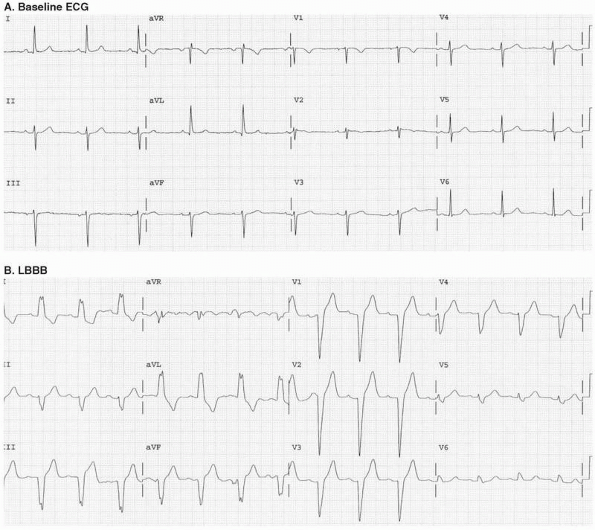 The precordial leads show classical RBBB with rR′, RR′, or rsR′ in V1 and qRS in V6. The limb leads show left axis deviation >-30° with deep rS complex in lead II and tall R in aVL. Figure 10.5: Diagrammatic Representation of Right Bundle Branch Block + Left Posterior Fascicular Block. The classical pattern of right bundle branch block is recognized in the precordial leads with rR′ or rsR′ in V1 and qRS in V6. The limb leads show right axis deviation >90° with rS in lead I and tall R wave in lead aVF from left posterior fascicular block. Figure 10.6: Uncomplicated Right Bundle Branch Block. The QRS complexes are wide measuring ≥0.12 seconds with rsr' configuration in V1 and qRs configuration in V6. Wide S waves are noted in leads I and V6. The axis of the QRS complex in the frontal plane is normal. Figure 10.7: Right Bundle Branch Block + Left Anterior Fascicular Block. 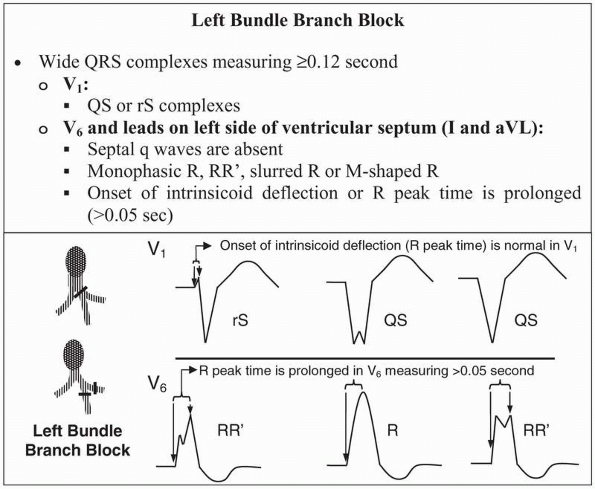 Right bundle branch block is recognized by the presence of wide QRS complexes measuring ≥0.12 seconds with rR′ or rsR′ in V1 and wide S waves in V6. Left anterior fascicular block is diagnosed by the presence of left axis deviation of -60° in the frontal leads. Figure 10.8: Right Bundle Branch Block + Left Posterior Fascicular Block. There is right bundle branch block with rR′ pattern in V1 and RS in V6. Left posterior fascicular block is diagnosed by the presence of right axis deviation of 120° in the frontal plane. Figure 10.9: ST and T Wave Changes in Right Bundle Branch Block. (A) When uncomplicated right bundle branch block is present, the terminal portion of the QRS complex and the ST segment and T waves are discordant. Note that the small arrows (pointing to the terminal QRS complex) are opposite in direction to the large arrows, which is pointing to the direction of the T wave. (B) When the ST and T waves are concordant (arrows are pointing in the same direction), the ST and T wave changes are primary and indicate the presence of a myocardial abnormality. · Secondary repolarization changes: In uncomplicated RBBB, the ST segment and T wave are normally discordant and opposite in direction to the terminal portion of the QRS complex (Fig. 10.9A). These ST-T changes are secondary to the abnormal activation of the ventricles. They are not included as criteria in the diagnosis of RBBB. o V1: Because the terminal portion of the QRS complex is an R′ wave in V1 (which is upright), the ST segment is isoelectric or depressed and the T wave is normally inverted (Fig. 10.9A). o V6: Because the terminal portion of the QRS complex is an S wave in V6, the ST segment is isoelectric or elevated and the T wave is normally upright. · Primary repolarization changes: When the ST and T waves are concordant (in the same direction as the terminal portion of the QRS complex; Fig. 10.9B), in the setting of RBBB, these changes are primary and due to the presence of an intrinsic myocardial disorder such as cardiomyopathy or myocardial ischemia rather than secondary to the abnormal activation of the ventricles. · Incomplete RBBB: Incomplete RBBB has all the features of complete RBBB except that the duration of the QRS complex is <0.12 seconds. In incomplete RBBB, there is delay rather than complete interruption of the impulse to the right ventricle. o ECG Findings: The ECG findings of incomplete RBBB are identical to those of complete RBBB except that the QRS complexes measure <0.12 seconds (Fig. 10.10). The axis of the QRS complex is normal unless there is LAFB or LPFB. § V1: Right precordial lead V1 shows an rsr′ or rR′ pattern very similar to that of complete RBBB. § V6: Left precordial lead V6 will show a slightly widened S wave. · Intermittent RBBB: RBBB often occurs intermittently before it becomes fixed (Fig. 10.11). Intermittent RBBB is usually rate related meaning that it usually occurs when the heart rate exceeds a certain level. Figure 10.10: Incomplete Right Bundle Branch Block. The QRS complexes are only minimally widened, measuring <0.12 seconds, with rSr′ in V1 and a minimally wide S wave in leads I and V6. This electrocardiogram is otherwise similar to that of complete right bundle branch block, as shown in Figure 10.6. Figure 10.11: Intermittent Right Bundle Branch Block. Lead V1 rhythm strip showing intermittent right bundle branch block (RBBB). Note the change in the width and configuration of the QRS complex in V1 with the onset of RBBB. · Ectopic ventricular impulses: Ectopic impulses originating from the ventricles have wide QRS complexes. These ectopic impulses are wide because they do not follow the normal conduction system and spread to the ventricles by muscle cell to muscle cell conduction. The wide complexes may be mistaken for bundle branch block. o Ventricular tachycardia: A common example is ventricular tachycardia with RBBB configuration. Although the QRS complexes are wide with tall R waves in V1, it is erroneous to conclude that there is RBBB during ventricular tachycardia. The ventricular tachycardia may originate from the left ventricle and spread to the right ventricle, causing the QRS complexes to have a RBBB pattern. Despite this appearance, RBBB is not present. o Accelerated idioventricular rhythm (AIVR): When ventricular impulses resulting from accelerated idioventricular rhythm occur, the wide QRS complexes may have a RBBB pattern and may be mistaken for RBBB (Fig. 10.12). · In true RBBB, the impulse should be sinus or supraventricular. When the impulse originates from the ventricles or below the bifurcation of the bundle of His, the impulse is ventricular. A ventricular impulse may demonstrate an RBBB configuration, even though RBBB is not present. · Wide QRS complexes measuring ≥0.12 seconds. o Right-sided precordial leads V1. § Large terminal R′ waves with rSR′ or rR′ often in an M-shaped configuration. § Onset of intrinsicoid deflection or R peak time is prolonged and is >0.05 seconds. o Left-sided precordial leads V6. § Wide S wave with qRS, RS, or rS pattern. § Septal Q waves are preserved. § Onset of intrinsicoid deflection or R peak time is normal and is ≤0.05 seconds. § Wide S waves in leads I and aVL. § The axis of the QRS complex is normal. · ST segment and T wave are opposite in direction (normally discordant) to the terminal QRS complex. 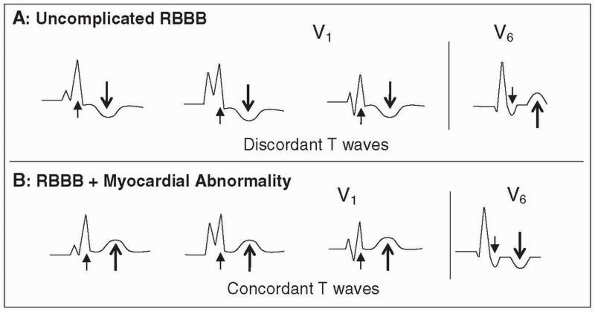 These ST and T wave changes are not included as criteria for the diagnosis of RBBB. § ST segment isoelectric or depressed. § ST segment isoelectric or elevated. § T wave is upright. · Wide QRS complex: The intraventricular conduction system activates both ventricles synchronously, resulting in a narrow QRS complex. When RBBB occurs, conduction of the impulse through the right bundle branch is delayed or interrupted, whereas conduction to the left bundle branch and left ventricle is preserved. Activation of the right ventricle is abnormal because the impulse must originate from the left ventricle by muscle cell to muscle cell conduction. Because the ventricles are activated sequentially instead of synchronously, the QRS complexes are wide measuring ≥0.12 seconds. The wide QRS complex can be divided into two halves: the initial half representing left ventricular activation and the terminal half representing right ventricular activation. o Vector 1: In RBBB, vector 1 or septal activation is not altered, thus the initial portion of the QRS complex remains preserved. A small r wave is normally recorded in lead V1, and a normal septal q wave is recorded in V6 as well as in leads located on the left side of the ventricular septum (leads I and aVL). o Vector 2: Activation of the left ventricular free wall or vector 2 is also preserved and normally occurs from endocardium to epicardium in a right to left direction. This result in deep S waves in V1 and tall R waves in V6. Activation of the right side of the septum, however, is no longer possible because the right bundle branch is blocked. Thus, septal activation continues unopposed in a left to right direction, which is opposite the direction of activation of the left ventricular free wall. Because the septum and left ventricular free wall are activated in opposite directions, the depth of the S wave in V1 and the height of the R wave in V6 are smaller than normal. o Vector 3: Whenever there is an intraventricular conduction abnormality, the area with the conduction abnormality is always the last to be activated. Activation of the right ventricle, therefore, is the last to occur in RBBB (vector 3). Because the right bundle branch supplies the right ventricle, and the right ventricle is located anterior and to the right of the left ventricle, the terminal impulse will be directed to the right and anteriorly. This results in a large terminal R′ in V1 and wide terminal S in V6 (and also in leads I and aVL). This is the most distinctive abnormality of RBBB. This terminal impulse is slow because it is conducted by direct myocardial spread and is unopposed because activation of the right ventricle is still ongoing, whereas activation of the rest of the ventricle is already completed. · Delayed onset of the intrinsicoid deflection or R peak time: The ventricular activation time is the time from onset of the ventricular impulse to the arrival of the impulse at the recording precordial electrode. It is measured from the onset of the QRS complex to the height of the R or R′ wave. The turning point or abrupt downward deflection of the R or R′ wave toward baseline is called the intrinsicoid deflection (see Chapter 6, Depolarization and Repolarization). For practical purposes, the R peak time has been recommended by the Cardiology Task Force of the World Health Organization/International Society and Federation to represent the onset of the intrinsicoid deflection. The normal onset of the intrinsicoid deflection in V1 is ≤0.03 seconds. When there is RBBB, the onset of the intrinsicoid deflection in V1 is prolonged and measures >0.05 seconds because conduction of the impulse across the right ventricle is delayed. The onset of the intrinsicoid deflection in leads V5 or V6p is preserved (normal ≤0.05 seconds) because the left bundle branch is intact. · Abnormal ST-T changes: The ST and T abnormalities in RBBB are secondary to abnormal activation of the ventricles and are normally discordant to the terminal portion of the QRS complex. The ST-T changes are not considered criteria for the diagnosis of RBBB. · QRS Axis: In uncomplicated RBBB, the axis of the QRS complex is within normal limits. However, when RBBB occurs in association with pulmonary hypertension or conditions that can cause right ventricular hypertrophy, the axis of the QRS complex may shift to the right. The axis of the QRS complex can also become abnormal when there is fascicular block or previous myocardial infarct. Figure 10.12: Accelerated Idioventricular Rhythm. The rhythm is normal sinus as shown by the first two complexes on the left. The wide QRS complexes that follow (arrows) look like intermittent right bundle branch block with tall R waves in V1. The wide QRS complexes are ventricular escape complexes because of accelerated idioventricular rhythm. Note that the wide QRS complexes are not preceded by P waves and occur only when there is slowing of the sinus node. · Incomplete RBBB with a terminal r′ wave in V1 or V2 does not always imply that a conduction block is present in the right bundle branch. This ECG pattern could also be due to delayed conduction of the impulse to the right ventricle, causing the right ventricle to be partly activated by the left bundle branch. It could also be due to delayed activation of the base of the right or left ventricle due to a focal area of hypertrophy. For example, in infants and children, the terminal r′ in V1 may be due to hypertrophy of the outflow tract of the right ventricle, a condition that may persist through adulthood. It has also been shown than an rSr′ pattern in V1 or V2 may occur if the precordial leads V1 and V2 are inadvertently positioned higher than the correct location at the 4th intercostal space, a common error among house officers or technicians who are not properly trained to record ECGs. · Because the right bundle branch is partially subendocardial in location, it is vulnerable to sudden and severe increases in right ventricular pressure. RBBB can therefore occur in the setting of pulmonary hypertension or acute pulmonary embolism. The right bundle branch is also vulnerable to local injury during right heart catheterization. Thus, extreme caution should be exercised when inserting a pulmonary artery catheter in a patient who has preexistent left bundle branch block (LBBB). · RBBB may initially occur intermittently before it becomes fixed. When RBBB is intermittent, it is usually rate related. In rate-related bundle branch block, bundle branch block occurs only when the heart rate increases above a certain threshold. Normal conduction is restored when the heart rate slows down to baseline. The presence of rate-related bundle branch block is often suspected when the wide QRS complexes normalize after a long compensatory pause of a premature ectopic impulse. · Clinical significance: RBBB can occur as an isolated finding in the general population, including young individuals without evidence of cardiac disease. Among 110,000 subjects screened for cardiovascular disease during a 25-year period, isolated RBBB (no evidence of heart disease or hypertension) occurred in 198 cases (0.18%) and was associated with an excellent prognosis. In another study consisting of 1,142 elderly men followed in the Baltimore Longitudinal Study on Aging, 39 or 3.4% had complete RBBB. Twenty-four of these patients had no evidence of heart disease. Long-term follow-up of patients who are apparently healthy and completely asymptomatic had not shown any adverse effects on mortality and morbidity. · RBBB and LAFB is a common combination because the right bundle and left anterior fascicle are adjacent to each other, straddling both sides of the ventricular septum. Both are supplied by the left anterior descending coronary artery. Thus, a concurrent RBBB and LAFB is a common complication of acute anteroseptal myocardial infarction (MI). When RBBB with fascicular block is due to acute anterior MI, the myocardial damage is usually extensive, resulting in a higher incidence of atrioventricular (AV) block, pump failure, and ventricular arrhythmias. However, if the RBBB is due to degenerative disease of the conduction system with preservation of myocardial function, progression to complete AV block is slow, and long-term prognosis is good. · RBBB and MI: The presence of RBBB generally does not conceal the ECG changes associated with Q wave MI. This contrasts with LBBB, where ECG changes of acute MI are usually masked by the conduction abnormality. Thus, Q waves will continue to be useful in signifying acute or remote MI in patients with RBBB. · RBBB and stress testing: According to the American College of Cardiology/American Heart Association guidelines for chronic stable angina, the presence of RBBB on a baseline ECG during exercise stress testing will not interfere with the detection of myocardial ischemia. The ST segment depression in leads V1 to V3 may not be related to myocardial ischemia; however, ST depression in leads V5, V6, II, and aVF is as reliable in indicating myocardial ischemia as in ECGs without RBBB. Thus, patients with RBBB on baseline ECG may undergo ECG exercise stress testing similar to patients without the conduction abnormality. This contrasts with patients with LBBB in whom ST depression does not necessarily imply the presence of myocardial ischemia (see Left Bundle Branch Block section in this chapter). Unlike patients with RBBB, patients with LBBB should undergo imaging in conjunction with ECG stress testing. · RBBB and congestive heart failure: In patients with severe left ventricular dysfunction with ongoing symptoms of congestive heart failure intractable to standard medical therapy, the presence of wide QRS complexes—including patients with RBBB—may be candidates for resynchronization therapy (see Left Bundle Branch Block section in this chapter). · Causes of RBBB: RBBB can be due to several causes, including acute MI, cardiomyopathy, pulmonary hypertension, pulmonary embolism, cor pulmonale, acute myocarditis, valvular heart disease (especially aortic stenosis), sclerodegenerative changes involving the conduction system, infiltrative diseases such as sarcoidosis and amyloidosis, Chagas disease, and congenital heart disease such as tetralogy of Fallot and Ebstein's anomaly. It may occur as a complication of cardiac surgery or interventional procedures such as cardiac catheterization, percutaneous coronary intervention, radiofrequency ablation, or alcohol ablation of the ventricular septum in patients with idiopathic hypertrophic subaortic stenosis. It may also be a normal finding in young individuals. · Auscultatory findings: Auscultatory findings associated with RBBB include delayed closure of the pulmonic valve resulting in wide splitting of the second heart sound. There may also be delay in the closure of the tricuspid valve resulting in wide splitting of the first heart sound. · The overall prognosis of patients with RBBB depends on the associated cardiac abnormality. o Asymptomatic RBBB does not require any therapy and may be a normal finding in younger asymptomatic individuals or in older patients without evidence of cardiac disease. When RBBB is an isolated abnormality, progression to complete AV block is uncommon, occurring <1% per year. Even patients with isolated RBBB who subsequently go on to develop complete AV block can expect to have a normal life span after placement of a permanent pacemaker. o RBBB with or without fascicular block complicating acute anterior MI is associated with a mortality of >20%. Most of these patients have extensive myocardial damage and will succumb to ventricular arrhythmias and pump failure rather than complete AV block. Thus, insertion of a permanent pacemaker in these patients may prevent AV block, but may not alter the overall prognosis. Practice guidelines recommend that patients who survive an acute MI with a final ejection fraction ≤35% should have an automatic defibrillator implanted regardless of the presence or absence of arrhythmias or conduction abnormality. The underlying cardiac disease, therefore, is most important in defining the prognosis of patients with RBBB. · LBBB: Conduction of the sinus impulse can be interrupted at the main left bundle or more distally at the level of both fascicles resulting in LBBB (Fig. 10.13). · ECG findings: When the left bundle branch is blocked, activation of the left ventricle is delayed resulting in wide QRS complexes that measure ≥0.12 seconds. The ECG findings of LBBB are best recognized in precordial leads V1 and V6. In lead V1, a QS or rS complex is recorded. In V6, the septal q wave is no longer present. A tall monophasic R wave often with initial slurring or M-shaped configuration is present, and onset of intrinsicoid deflection or R peak time is prolonged (>0.05 seconds). · Incomplete LBBB: Incomplete LBBB is similar to complete LBBB except that the duration of the QRS complex is <0.12 seconds. In incomplete LBBB, there is a delay (rather than a complete interruption) in the conduction of the impulse to the left bundle branch. Figure 10.13: Left Bundle Branch Block. V1 and V6 are the most important leads in recognizing left bundle branch block. The QRS complexes in V1 will show deep QS or rS complexes and V6 will show rR′, monophasic R, or RR′ often M-shaped configuration. The R peak time or onset of the intrinsicoid deflection in V6 is shown by the arrows and is delayed (>0.05 seconds). No septal Q waves are present. Figure 10.14: Left Bundle Branch Block. In left bundle branch block, the QRS complexes are wide with a QS or rS complex in V1and tall monophasic R wave in V6 without septal q waves. The ST segment and T waves are normally discordant. · ECG Findings: In incomplete LBBB, the QRS complexes are slightly widened, measuring <0.12 seconds. All the features of LBBB are present; septal q waves in V5 or V6 are absent, and either a QS complex or a small r wave (rS complex) is present in V1 (Fig. 10.14, Fig. 10.15). · The left ventricle is supplied by two main fascicles: the left anterior and left posterior fascicles. LBBB is therefore considered a bifascicular block. Although a midseptal fascicle also exists, its significance is uncertain and there are presently no diagnostic criteria for lesions involving the mid-septal branch. · In LBBB, the abnormal activation of the left ventricle can result in ECG abnormalities that may be mistaken for left ventricular hypertrophy. The presence of abnormal q waves and ST-T abnormalities can mimic MI. Conversely, LBBB can mask the ECG changes of acute MI. · The abnormal activation of the left ventricle can cause wall motion abnormalities, even in patients without myocardial disease. It may also result in mitral regurgitation because of asynchrony in the contraction of the anterior and posterior papillary muscles. These abnormalities are enhanced when myocardial disease is superimposed on the conduction defect. In general, patients with LBBB with very wide QRS complexes (Fig. 10.16) have more severe contraction abnormalities and lower ejection fractions compared with patients with LBBB with narrower complexes. Figure 10.15: Incomplete Left Bundle Branch Block. 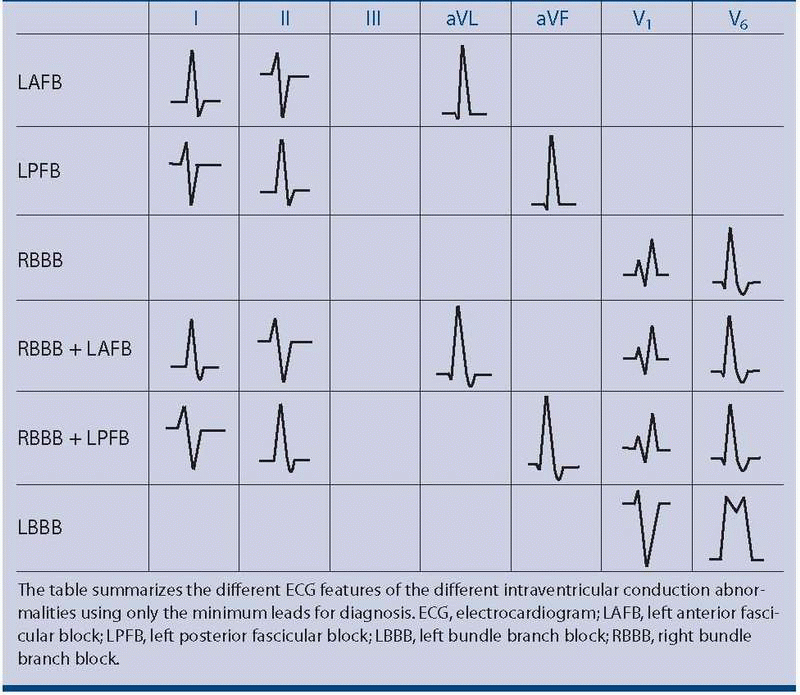 In incomplete left bundle branch block (LBBB), the QRS complexes have all the features of LBBB. QS or rS configuration is present in V1, tall monophasic R waves are present in V6, and no septal q waves in V6. The duration of the QRS complex, however, is <0.12 seconds. Figure 10.16: Left Bundle Branch Block with Unusually Wide QRS Complexes. The QRS complexes measure almost 0.20 seconds and the axis is shifted to the left. The unusual width of the QRS complexes is often a marker of severe myocardial disease, especially when there is right or left axis deviation. · The axis of the QRS complex in LBBB is variable. When LBBB is associated with left axis deviation, the conduction abnormality is more widespread and may involve the distal fascicles and Purkinje system. When right axis deviation is present, it may be associated with diffuse myocardial disease and biventricular enlargement. · Secondary ST and T wave changes: Similar to RBBB, the ST-T changes are not included as criteria in the ECG diagnosis of LBBB. The ST-T changes associated with uncomplicated LBBB are secondary to abnormal activation of the left ventricle. The direction of the ST segment and T wave is normally discordant or opposite that of the QRS complex (Fig. 10.17A). o V1: In V1, the ST segment is normally elevated and the T wave upright because the terminal portion of the QRS complex is an S wave, which is negative or downward. Figure 10.17: ST Segment and T Waves in Left Bundle Branch Block. (A) The ST segment and T wave are normally opposite in direction (discordant) from that of the QRS complex when there is uncomplicated left bundle branch block. Note that the small arrow (pointing to the QRS complex) is opposite in direction to the large arrow, which is pointing to the T wave. (B) When there is myocardial disease, such as myocardial ischemia or cardiomyopathy, the ST segments and T waves become concordant and follow the direction of the QRS complex. Note that the small and large arrows are pointing in the same direction. Figure 10.18: Rate-Related Left Bundle Branch Block (LBBB). Electrocardiogram (ECG) A shows sinus rhythm, 83 beats per minute with narrow QRS complexes. ECG B is from the same patient showing sinus tachycardia of 102 beats per minute and LBBB. The LBBB is rate related developing only during tachycardia. Note that after the compensatory pause of the PVC in ECG B, there is narrowing of the QRS complex (arrows) similar to the QRS complex in ECG A. The long pause after the PVC allows the left bundle branch to recover and conducts the next impulse normally. o V6: In V5 or V6, the ST segment is isoelectric or depressed and the T wave inverted because the terminal portion of the QRS complex is upright. · Primary ST and T wave changes: When the ST segment and T wave changes are concordant in the setting of LBBB, they are primary and due to the presence of an intrinsic myocardial disorder such cardiomyopathy or myocardial ischemia rather than secondary to the abnormal activation of the ventricles (Fig. 10.17B). · LBBB may be rate related (Figs. 10.18, 10.19, and 10.20). In rate-related LBBB, the bundle branch block becomes manifest only when there is tachycardia or bradycardia. This contrasts with fixed bundle branch block, which is present regardless of the heart rate. · Table 10.1 is a diagrammatic representation of the different intraventricular conduction abnormalities using only the minimum leads necessary for diagnosis. · Wide QRS complex: When there is LBBB, conduction of the electrical impulse to the right bundle branch occurs normally and conduction of the impulse through the left bundle branch is delayed or interrupted. This results in wide QRS complexes measuring ≥0.12 seconds because of asynchronous activation of the ventricles. · Delayed onset of the intrinsicoid deflection or R peak time in Vn5 or V6: The intrinsicoid deflection refers to the abrupt downward deflection of the R wave on arrival of the impulse at the recording electrode. When there is LBBB, activation of the right ventricle is preserved because conduction through the right bundle branch is intact. Thus the onset of the intrinsicoid deflection in V1 is normal, measuring ≤0.03 seconds. Activation of the left ventricle is delayed because there is a block in the left bundle branch. Thus the onset of the intrinsicoid deflection in V5 and V6 is delayed, measuring >0.05 seconds. Figure 10.19: Rate-Related Left Bundle Branch Block (LBBB). 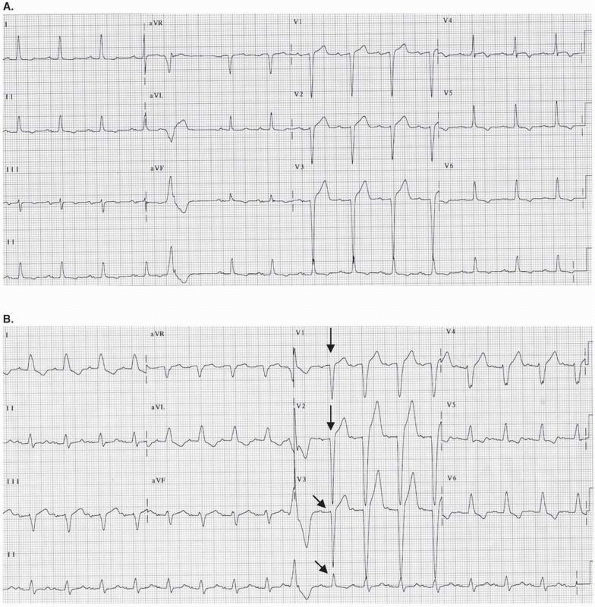 (A) A 12-lead electrocardiogram (ECG) obtained a few hours before (B). The QRS complexes are narrow with left axis deviation because of left anterior fascicular block. (B) ECG from the same patient a few hours later showing LBBB. QS complexes with tall voltages are present in V1 to V3, which can be mistaken for anteroseptal myocardial infarction or left ventricular hypertrophy. Marked ST depression is noted in I and aVL and marked ST elevation is noted in V1 to V3, which can be mistaken for acute coronary syndrome. Figure 10.20: Bradycardia-Dependent Bundle Branch Block. Rhythm strip showing widening of the QRS complex (arrow) after a pause from bradycardia-dependent bundle branch block. · Absence of septal q wave in V5 or V6: Normally, the ventricular septum is activated by the left bundle branch in a left to right direction (vector 1) resulting in a small septal q wave in V5 or V6 and a small r wave in V1. When there is LBBB, the ventricular septum is no longer activated in a left-to-right direction. Rather, it is activated by the right bundle branch in a right-toleft direction, which is the reverse of normal. The normal septal q wave in V5 or V6 is no longer recorded and should not be present when there is LBBB. V1 and V2 may record a small r wave, representing activation of the right ventricular wall and apex. The small r wave in V1 does not represent septal activation. Slurring of the upstroke of the R wave with rR′ or RR′ (M-shaped) configuration of the QRS complex in V6: After the right ventricle is activated, the impulse moves from right ventricle to left ventricle across the interventricular septum by myocardial cell to myocardial cell conduction. This results in tall R waves in V6 and deep S waves in V1 and V2. The initial R wave in V6 represents activation of the ventricular septum, and the larger terminal R′ deflection represents activation of the left ventricular free wall. The dip or notch between the initial R and terminal R′ is due to activation of a smaller mass of myocardium between the septum and left ventricular free wall. Deep S waves often with slurred downstroke are recorded in V1 and V2. · Absence of terminal r′ in V1 and absence of terminal s waves in V6:Whenever there is an intraventricular conduction abnormality, the area supplied by the blocked bundle branch is delayed and will be the last to be activated. Because the left bundle branch supplies the left ventricle and the left ventricle is located to the left and posterior to the right ventricle, the terminal impulse will be directed to the left and posteriorly. Right-sided precordial leads such as V1 or V2 should not record a terminal r′ wave, and left sided precordial leads V5 or V6 should not record a terminal S or s wave. · Rate-related bundle branch block: Bundle branch block, left or right, may be rate related before it becomes fixed. When LBBB is rate related, LBBB occurs only when the heart rate becomes increased or decreased. When LBBB is fixed or permanent, LBBB persists regardless of the heart rate. o Bradycardia-dependent bundle branch block: In bradycardia-dependent bundle branch block, RBBB or LBBB occurs only when there is bradycardia or slowing of the heart rate. Bradycardia-dependent bundle branch block is due to phase 4 diastolic depolarization, which is inherently present in cells with automatic properties, including cells within the intraventricular conduction system. When there is a long R-R interval, cells with automatic properties undergo spontaneous phase 4 diastolic depolarization resulting in a transmembrane potential that slowly becomes less and less negative. Thus, the sinus impulse may not be able to conduct across a bundle branch that is partially depolarized. o Tachycardia-related bundle branch block: The refractory period of one bundle branch is usually longer than the refractory period of the other bundle branch. When the heart rate is relatively slow, both bundle branches are given enough time to repolarize. However, when the heart rate is faster, the impulses may arrive well before the bundle branch with a longer refractory period has a chance to recover. This may result in bundle branch block that is evident during tachycardia, that resolves when the heart rate slows down to baseline. The longer refractory period of one bundle branch is due to its longer action potential duration when compared with the other bundle branch. This type of rate-related bundle branch block is called phase 3 aberration. · Unlike the right bundle branch, which is long and thin, the left bundle branch immediately divides into two main fascicles: the left anterior and left posterior fascicles. A midseptal branch also exists, although there are no criteria diagnostic of a midseptal lesion. LBBB therefore is an example of bifascicular block. LBBB can occur in the main left bundle (predivisional) or at the level of the fascicles (postdivisional). It can also occur at the level of the bundle of His. · Clinical significance: LBBB can occur as an isolated finding in normal, asymptomatic individuals without evidence of cardiac disease but is rare. o In a study of 122,043 asymptomatic and healthy airmen, only 17 individuals were noted to have LBBB compared with 231 with RBBB. In this study, none of 44,231 men younger than age 25 had LBBB. o In another study of 110,000 individuals, isolated LBBB occurred in 112 cases (0.1%) without apparent or suspected heart disease, compared with 198 cases of isolated RBBB (0.28%). The overall mortality in patients with isolated LBBB was not increased when compared with patients with RBBB during a mean follow-up of 9.5 years. However, patients with isolated LBBB but not RBBB had increased risk of developing overt cardiovascular disease, which may, in the long run, translate into a higher morbidity and mortality. § In the Framingham study, 55 of 5,209 individuals (1%) developed new-onset LBBB during a follow-up period of 18 years. The mean age of onset was 62 years. LBBB was associated with hypertension (defined as blood pressure of ≥160/95 mm Hg), ischemic heart disease, or primary myocardial disease among 47 of the 55 patients. Only 9 of 55 patients (16%) were free of cardiovascular disease during a mean follow-up period of 6 years after the onset of LBBB. § A 40-year follow-up study of 17,361 subjects in Hiroshima and Nagasaki, Japan, who underwent biennial health examinations showed 110 subjects with LBBB. The average age at diagnosis was 69.6 ± 10 years in men and 68.3 ± 10.9 years in women, with progressive increase in the incidence of LBBB with age. There was a higher incidence of hypertension, ischemic heart disease, left ventricular hypertrophy with ST-T abnormalities, and increased cardiothoracic ratio among patients who developed LBBB when compared with controls. Age at death was similar for patients with LBBB and controls, although mortality from congestive heart failure and myocardial infarction was significantly higher in patients with LBBB. § Finally, among 723 asymptomatic patients with normal left ventricular ejection fraction incidentally diagnosed to have bundle branch block (58.1% LBBB and 41.9% RBBB) in a community-based patient population, retrospective analysis of computerized medical records after 24 years' follow-up showed that isolated bundle branch block is not a benign finding. Cardiac-related morbidity and mortality is similar to patients with known conventional risk factors without bundle branch block. · Etiology: LBBB is an acquired conduction disorder and is usually a marker of an underlying cardiac abnormality in contrast to RBBB, which may be congenital and may remain as an isolated finding. The majority of patients with LBBB, but not RBBB, have cardiac disease. If cardiac disease is not apparent, it is very likely that overt cardiac abnormality will subsequently develop. The common causes of LBBB include hypertension, coronary artery disease, valvular diseases (especially aortic stenosis), cardiomyopathy, acute myocarditis, and degenerative disease of the conduction system. LBBB is generally a marker of left ventricular disease and is the most common conduction abnormality in patients with primary cardiomyopathy. · Hemodynamic abnormalities: LBBB can diminish cardiac performance even in the absence of associated myocardial disease. In LBBB, the ventricles are activated sequentially rather than synchronously. Thus, left and right ventricular contraction is not simultaneous. Furthermore, because conduction of the impulse within the left ventricle is by direct myocardial spread, contraction of the left ventricle is not synchronized and can result in wall motion abnormalities. Mitral regurgitation can occur when the two papillary muscles are not simultaneously activated. The significance of these contraction abnormalities may not be apparent in patients with reasonably good left ventricular systolic function. However, in patients who have myocardial disease and severe left ventricular dysfunction, the presence of LBBB can make systolic dysfunction even more pronounced. · LBBB makes diagnosis of certain disorders difficult: When LBBB is present, the ECG becomes unreliable as a diagnostic tool for identifying a variety of clinical entities. o Left ventricular hypertrophy: Left ventricular hypertrophy will be difficult to diagnose when there is LBBB because of the tall voltage and secondary ST-T changes associated with LBBB. Nevertheless, approximately 85% of patients with LBBB will have left ventricular hypertrophy. o Acute MI: Acute MI is difficult to diagnose when LBBB is present because q waves and ST-T abnormalities associated with acute MI can be obscured by the LBBB. Conversely, when LBBB is present, Q waves or QS complexes may occur in the anterior precordial leads and may mimic a myocardial infarct. The ST-T changes of LBBB can also be mistaken for current of injury (see acute MI and LBBB Chapter 23, Acute Coronary Syndrome: ST Elevation Myocardial Infarction). The following findings suggest the presence of MI when there is LBBB. § Acute MI should be suspected when there is concordant ST segment depression or concordant ST segment elevation ≥1 mm in a patient with symptoms of myocardial ischemia. Concordant ST segment depression is present when the QRS complex is negative and the ST segment is depressed. Concordant ST segment elevation is present when the QRS complex is positive and the ST segment is elevated. § Acute MI should also be suspected when there is discordant ST segment elevation ≥5 mm accompanied by symptoms of ischemia. This implies that ST segment elevation of at least 5 mm is present in leads with deep S waves such as V1, V2, or V3. § Notching of the upstroke of the S wave in V3 or V4, also called Cabrera sign, or the upstroke of the R wave in V5 or V6, also called Chapman sign, are highly specific but not very sensitive for MI. § Q waves in leads V5 or V6 or leads located at the left side of the ventricular septum (I or aVL) indicate an MI, which may be recent or remote. o During stress testing: LBBB can cause a false-positive or a false-negative stress test. § ECG stress testing: During stress testing, LBBB may mask the ECG changes of myocardial ischemia resulting in a false-negative stress test. Conversely, LBBB can result in a false-positive stress test because it can cause secondary ST-T changes in the ECG, which may be misinterpreted as being due to ischemia. Thus, the American College of Cardiology/American Heart Association guideline on chronic stable angina does not recommend stress testing in patients with LBBB using ECG alone as a marker for myocardial ischemia. This is a Class III indication, meaning that there is evidence that the procedure is not useful. Stress testing of patients with complete LBBB on baseline ECG should always include an imaging modality, preferably a nuclear perfusion scan. § Stress testing with imaging: Nuclear scan uses perfusion mismatch, whereas echo uses wall motion abnormality as the end point for detecting myocardial ischemia. Because left ventricular wall motion abnormalities inherently occur when there is LBBB, a nuclear perfusion scan is preferred over echocardiography as the imaging modality during stress testing. Pharmacologic stress testing is preferred over exercise when LBBB is present because exercise can further augment the wall motion abnormalities of LBBB even in the absence of ischemia. Dipyridamole or adenosine (but not dobutamine) are preferred because both agents do not alter contractility. § Auscultatory findings: The presence of LBBB will delay closure of the mitral and aortic valves. This will cause the first heart sound to become single and the second heart sound to be paradoxically split. When paradoxical splitting of the second heart sound is present, the second heart sound becomes single or narrowly split with inspiration and widely split with expiration. This pattern is the opposite of normal. A short murmur of mitral regurgitation may be audible during early systole because of asynchrony in contraction of the papillary muscles. The presence of mild mitral regurgitation from LBBB, however, is better shown with color Doppler imaging during echocardiography. · LBBB is usually associated with cardiac disease more commonly coronary disease, hypertension, valvular disease, or cardiomyopathy. Overall treatment depends on the underlying cardiac condition. In completely asymptomatic patients without known cardiac disease, no treatment is required. · LBBB is a bifascicular block that may progress to trifascicular block or complete AV block. In patients with trifascicular block, insertion of a permanent pacemaker is warranted (seeChapter 11, Intraventricular Conduction Defect: Trifascicular Block; see also the American College of Cardiology/American Heart Association/Heart Rhythm Society guidelines on permanent pacemaker implantation in patients with bifascicular and trifascicular block). · Similar to RBBB, the overall prognosis depends on the etiology of the LBBB. o In the Framingham study, patients who did well were those with normal axis of the QRS complex (to the right of 0°), those without any left atrial abnormality or left atrial conduction delay and those who did not have changes in the ECG before the development of LBBB. o Among older patients with LBBB, majority had antecedent cardiomegaly, hypertension, or coronary disease. If they did not have any of these findings, the majority went on to develop one of these cardiovascular abnormalities. The presence of these cardiovascular diseases will translate into a higher mortality. o Finally, long-term follow-up studies show that patients with LBBB have a higher incidence of cardiovascular disease with higher mortality from congestive heart failure and acute MI, although all-cause mortality may not be significantly different among patients with LBBB compared with those who do not. Bax JJ, Ansalone G, Breithardt OA, et al. Echocardiographic evaluation of cardiac resynchronization therapy: ready for routine clinical use? A critical appraisal. J Am Coll Cardiol.2004;44: 1-9. Dunn MI, Lipman BS. Abnormalities of ventricular conduction: right bundle-branch block. In: Lippman-Massie Clinical Electrocardiography. 8th ed. Chicago: Yearbook Medical Publishers, Inc.; 1989:117-132. Dunn MI, Lipman BS. Abnormalities of ventricular conduction: left bundle-branch block. In: Lippman-Massie Clinical Electrocardiography. 8th ed. Chicago: Yearbook Medical Publishers, Inc.; 1989:133-147. Epstein AE, DiMarco JP, Ellenbogen KA, et al. ACC/AHA/HRS 2008 guidelines for device-based therapy of cardiac rhythm abnormalities: a report of the American College of Cardiology/American Heart Association Task Force on Practice Guidelines (Writing Committee to Revise the ACC/AHA/ NASPE 2002 Guideline Update for Implantation of Cardiac Pacemakers and Antiarrhythmia Devices). Circulation. 2008;117: e350-e408. Fahy GJ, Pinski SL, Miller DP, et al. Natural history of isolated bundle branch block. Am J Cardiol. 1996;77:1185-1190. Fleg JL, Das DW, Lakatta EG. Right bundle branch block: long term prognosis in apparently healthy men. J Am Cardiol. 1983;1:887-892. Francia P, Balla C, Paneni F, et al. Left bundle-branch block—pathophysiology, prognosis, and clinical management. Clin Cardiol. 2007;30:110-115. Gibbons RJ, Abrams J, Chatterjee K, et al. ACC/AHA 2002 guideline update for the management of patients with chronic stable angina: a report of the American College of Cardiology/American Heart Association Task Force on Practice Guidelines (Committee to Update the 1999 Guidelines for the Management of Patients with Chronic Stable Angina. www.acc.org/clinical/guidelines/stable/stable.pdf. Goldberger AL, Arnsdorf MF. Electrocardiographic diagnosis ofmyocardial infarction in the presence of bundle branch block or a paced rhythm. 2008 UpToDate. www. uptodate.com. Hiss RG, Lamb LE. Electrocardiographic findings in 122,043 individuals. Circulation. 1962;25:947-961. Imanishi R, Seto S, Ichimaru S, et al. Prognostic significance of incident left bundle branch block observed over a 40-year period. Am J Cardiol. 2006;98:644-648. Marriott HJL. The hemiblocks and trifascicular block. In: Practical Electrocardiography. 5th ed. Baltimore: The Williams and Wilkins Company, 1972:86-94. Miller WL, Ballman KV, Hodge DO, et al. Risk factor implications of incidentally discovered uncomplicated bundle branch block. Mayo Clinic Proc. 2005;80:1585-1590. Schneider JF, Thomas Jr HE, McNamara PM, et al. Clinicalelectrocardiographic correlates of newly acquired left bundle branch block: the Framingham study. Am J Cardiol. 1985; 55:1332-1338. Sgarbossa EB, Pinski SL, Barbagelata A, et al. Electrocardiographic diagnosis of evolving acute myocardial infarction in the presence of left bundle branch block. N Engl J Med.1996;334:481-487. Strickberger SA, Conti J, Daoud EG, et al. Patient selection for cardiac resynchronization therapy. Circulation. 2005;111: 2146-2150. Trevino AJ, Beller BM. Conduction disturbance of the left bundle branch system and their relationship to complete heart block I. A review of experimental, electrophysiologic and electrocardiographic aspects. Am J Med. 1971;51:362-373. Trevino AJ, Beller BM. Conduction disturbance of the left bundle branch system and their relationship to complete heart block II.A review of differential diagnosis, pathology and clinical significance. Am J Med. 1971;51:374-382.